Why Some Apple Varieties Become Trendy or Fashionable? Some apple varieties have unique characteristics, making them irresistible to consumers. There are tens of thousands of varieties of apples which have been named and described. Most are lost to history and only a few relative handfuls are commonly found in the produce aisle. So, the question is, why do some apples become trendy and fashionable while others languish? There really are two reasons, and it may be how you define trendy and fashionable. Grandpa is an old guy, so his idea of trendy and fashionable is likely to be very different than his grandchildren’s idea! Grandpa thinks the first reason is that the apple cultivar has good characteristics which make it easy for fruit growers to raise, store, package and sell on the commercial market. This may not seem to be a good reason to most, but it is an economic reality. The best example is probably the original Hawkeye Delicious apple which was discovered over a hundred years ago. It certainly wasn’t much to look at, but it had excellent flavor and was widely promoted. Over time, redder strains were chosen, and it became a staple variety in the produce section. Now, Red Delicious apples look nothing like the old Hawkeye. In fact, the Washington apple industry promoted the Red Delicious so much, that when someone thinks of an “apple” they are more than likely visualizing the iconic Washington state apple. Red Delicious was easy to grow, stored for too long a period (in my opinion) and sold well on the commercial market. It became trendy because of its heavy promotion. Another major reason that an apple may become fashionable isn’t because it’s particularly easy for growers to grow, but because it has a few great eating characteristics. 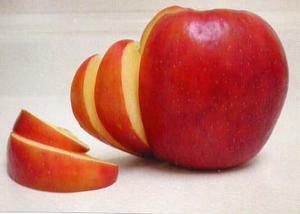 The consumer demands great eating more and more, and a great example of this would be Honeycrisp. This favorite trendsetter is so explosively crisp and crunchy, and has such a pleasant flavor and texture, consumers have demanded them and are willing to pay more. It was first planted only in small quantities by growers who sold it locally and at farmer’s markets; but because the demand increased so much, it is widely planted now. Many wonder why Honeycrisp is so pricey. The reason, without a doubt, is that it is the hardest apple in commercial production to produce. But, it started a fashion trend, and now new varieties being developed need similar characteristics to compete. Niche apples tend to become fashionable for a variety of reasons. Grandpa thinks the next trend will be “red fleshed” apples. They are not widely available in the U.S yet, just some of the old heirloom varieties have had some red flesh characteristics. New varieties are being bred and introduced, that will have intense red flesh and interesting flavors. Watch for them, Grandpa feels they will be out in the market in a couple of years. It would be nice to obtain and sell the newer, red fleshed varieties. However, because of patent and trademark laws Grandpa likely won’t have very many. There is an unfortunate trend in the commercial industry right now, which is to “club” or restrict production of these varieties to very few growers and markets. The best red-flesh (actually pink flesh) variety Grandpa’s Orchard offers, is known as the Pink Pearl apple. Order your Pink Pearl apple variety today.